Violence broke out on the third day of tax-reform protests in Costa Rica. 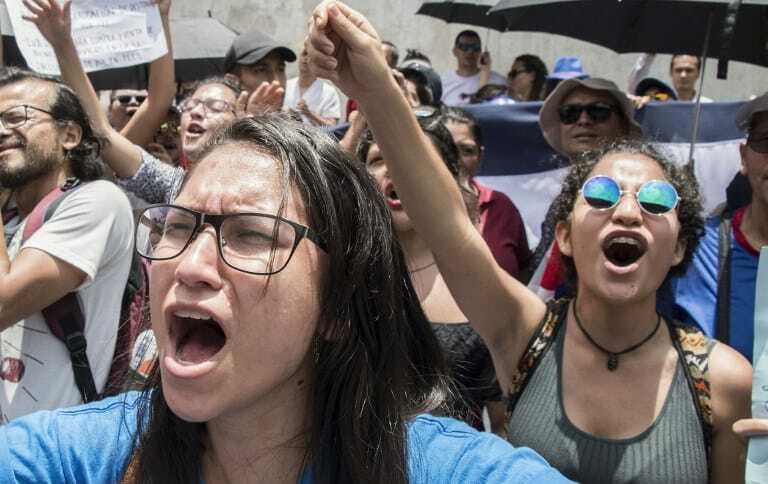 Protesters confronted police outside the Legislative Assembly in San José on Wednesday afternoon and students clashed with police outside the University of Costa Rica later that night. Wednesday’s march in San José started in La Sabana Park and thousands of protesters made their way to the Legislative Assembly. The protest turned tense after a group of protesters tore down a metal barricade and tried to force their way into the building. Riot police showed up to reinforce security until the group dispersed after an hour of tension. Lawmakers were sheltered in the building during that time. “I’m fighting for my kids’ food and future,” one protester’s sign said. “Let the rich and big capitalists pay,” said another. There were also brushes of violence in the Caribbean capital of Limón, some apparently caused by protesters. A truck was set ablaze by unknown perpetrators while about 150 people blocked the entrance to RECOPE, the national oil refinery. This led to police intervention to retake the facility to guarantee gasoline supply. “We have a significant [police] presence to guarantee that delinquents don’t try anything against citizens or the facilities,” said Michael Soto, Minister of Security. Police detained one RECOPE employee on suspicion of sabotaging the electrical system at the facility in Limón. Workers started the strike on Monday to oppose a proposed tax reform plan that the government hopes can contain the deficit. The deficit reached 6.2 percent of GDP in 2017 and is expected to grow to 7.2 percent this year. Economists warned that if tax reform isn’t passed, the country faces an economic downturn. At the center of the plan is a proposed 13 percent Value-Added Tax to replace the current 13 percent sales tax. This would allow the government to tax services as well as goods. The government said most of the public sector is functioning normally and hasn’t been affected by the strike. Public schools were the most affected. Only 55 percent of them are open, some partially. Costa Rica’s Social Security System (CCSS) said that it was able to complete 4,0000 medical appointments in the first few hours on Wednesday, although 43 percent of operating rooms weren’t operating.